Many people dream of the open road, but they are stuck forever in traffic. I didn’t have the freedom of empty Nevada highways. My daily commute restricts me to Boston traffic. This slow, deliberate time allowed me to get a feeling for the car in an everyday setting. Sitting in traffic with the RS 7 certainly allowed for some time to reflect. The seats are comfortable, and they provide just the right amount of support whether I was sitting in traffic or driving spiritedly. Pulling the gear selector back and moving into drive (instead of “sport”) makes maneuvering through the traffic a bit easier as the car is less jumpy. There’s still plenty of power available but moving back to drive mode smoothed out the throttle response, as it doesn’t react as quickly to inputs. The steering is sharp and variable as the steering effort reduces the slower the car is moving. Maneuvering in and out parking spaces takes minimal effort. But yet, you are constantly reminded of how wide the car is. The around view camera system certainly helps and is worth its weight in gold when trying to maneuver through tight streets and cramped parking garages. The bright Misano Red paint job and its hellish exhaust stands out. “I’ve never heard an Audi that sounds like this” was a common remark during my five days with the RS 7. Fellow Audi owners walked and struck up a conversation about the car. Others rolled down their windows in traffic to ask questions. 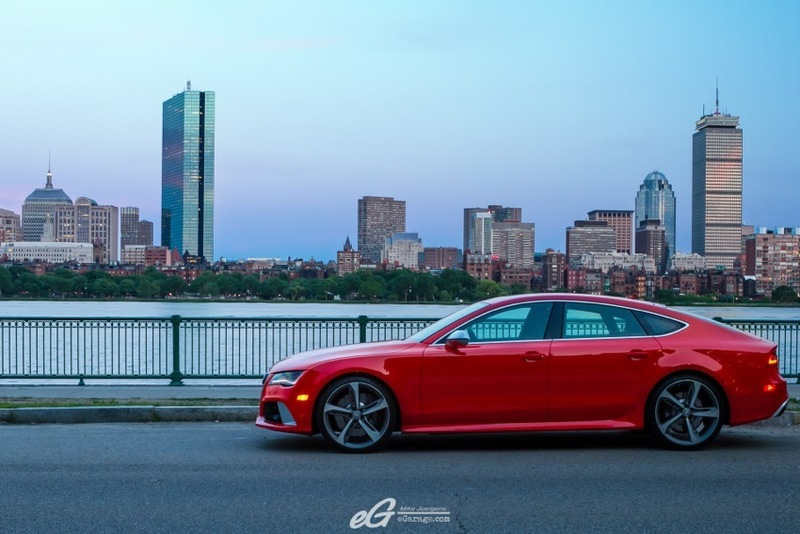 The RS 7 stands out in a city filled with average commuter cars. 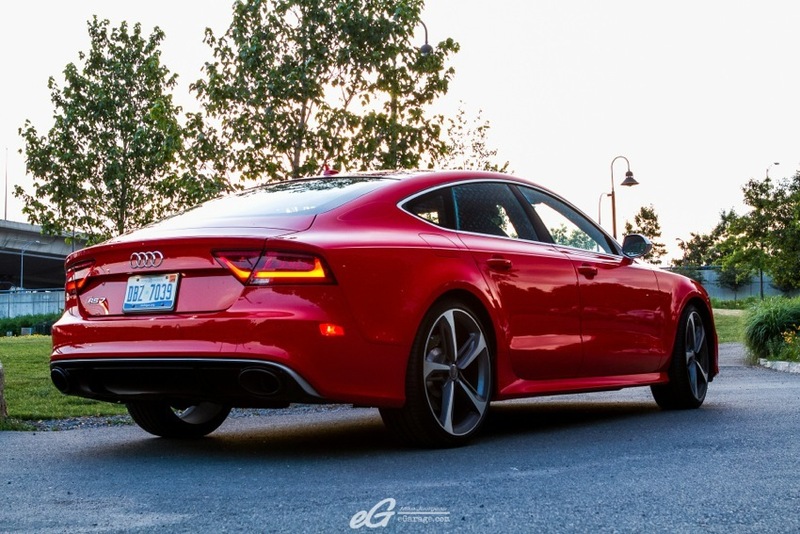 The RS 7 has an exhaust note like no other Audi. 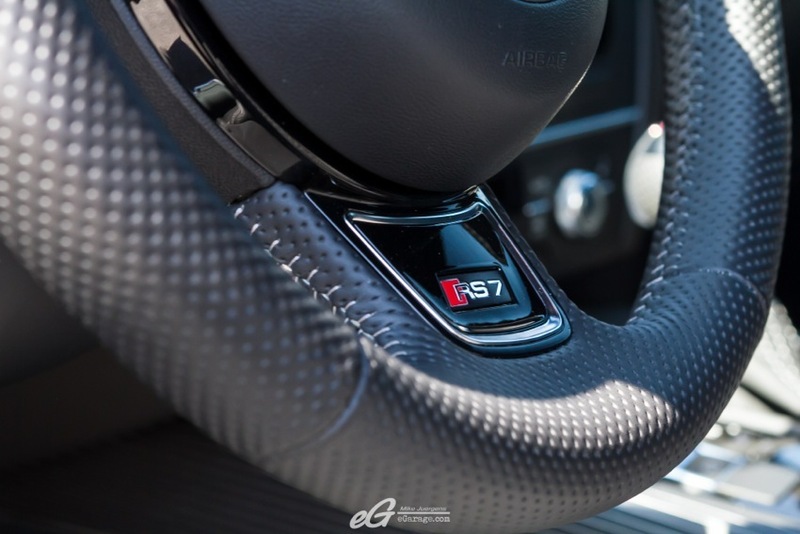 It pairs well with the 560HP 4.0 TFSI V8. Pressing the start button on the center console brings the car to life with a mighty roar. The tachometer and speedometer needles sweep their limits, the navigation screen slides into position, the Bang & Olufsen tweeters rise out of the dash and the steering wheel lowers to meet your hands. 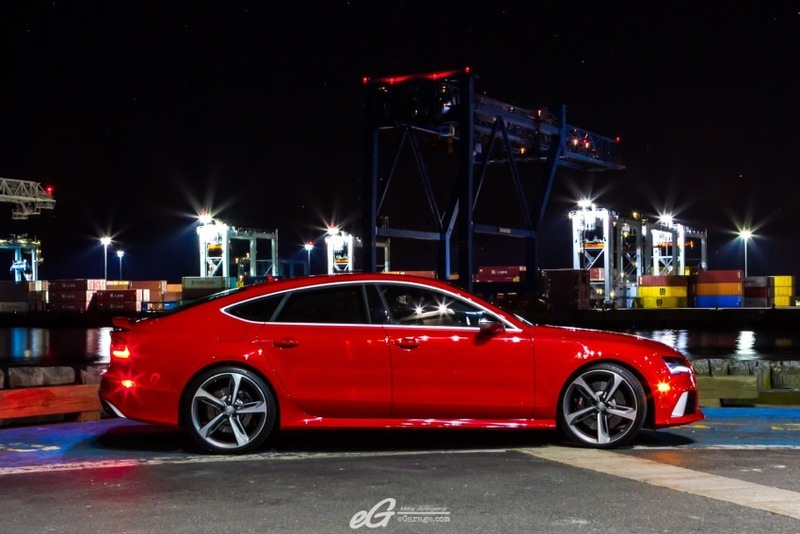 After a choreographed dance, the RS 7 is alive. 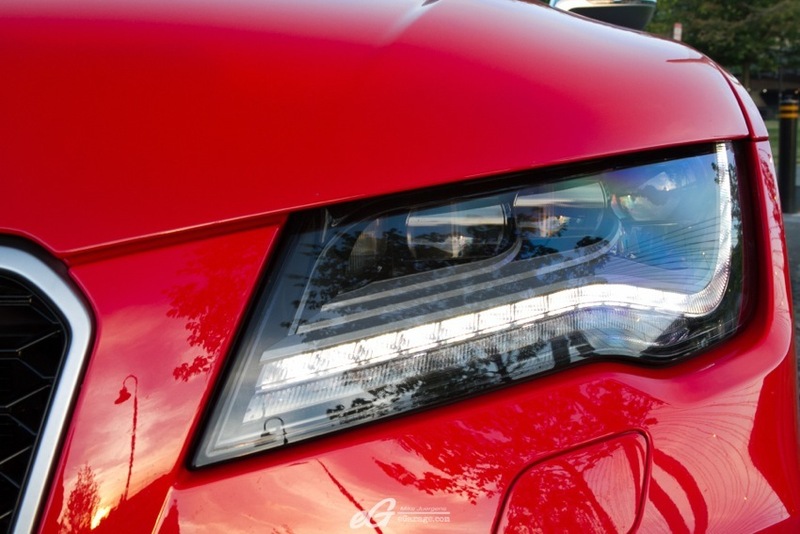 Selecting dynamic mode from the MMI drive select screen transforms the RS 7 into a Misano Red demon. One blip of the throttle greets you with a raspy roar and two loud pops in what former Quattro GmbH boss Francisus Van Meel described as “just a slight misunderstanding between the injection and ignition.” The raspy roar and backfires are integral to the visceral life of the RS 7. When releasing throttle input, the car greets you with two pops. When slowing down to a red light, the engine and transmission rev match and let out two more loud pops. When accelerating in manual mode the transmission holds first gear into redline with the mild rasp growing deeper until you click the upshift paddle. The lightning quick upshifts produce two more pops as the car rockets off. There’s a theme here. 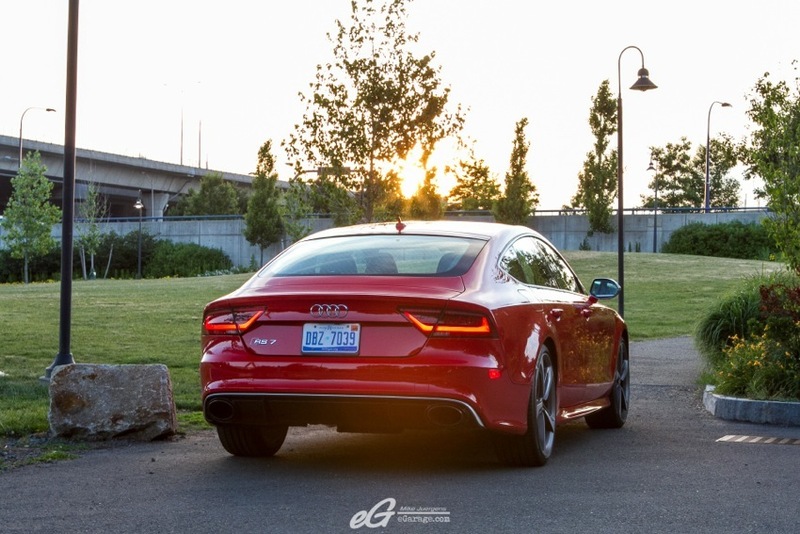 You can switch the RS 7 to comfort mode and instantly quiet the exhaust and soften the ride. But why would you? In even its extreme performance it’s still just so easy to drive. You could equate this to your uptight, well-educated friend who often transforms into the life of the party after a couple of drinks. 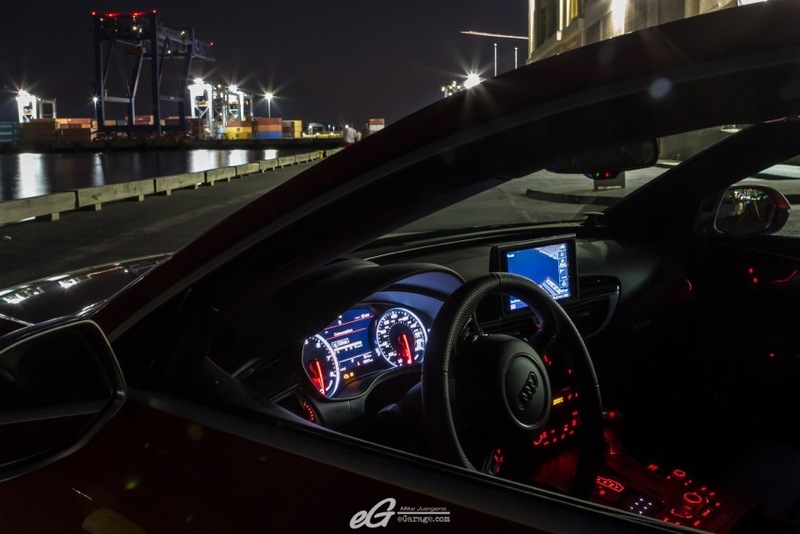 The RS 7 will transform with the twist of the MMI selector. Pushing the RS 7 deep into a tight turn rewards you with a smooth turn in and mountains of grip. 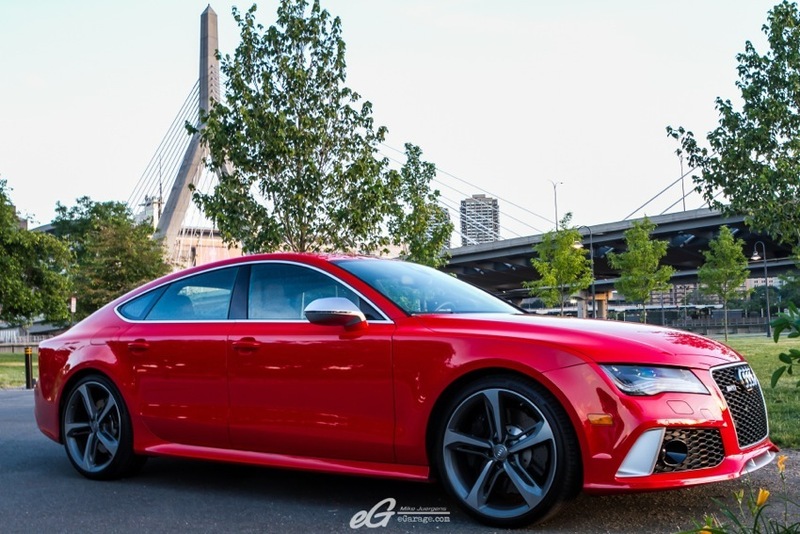 The RS 7’s locking center-differential, the rear sport differential, and the air suspension all work together allowing you to push the car to the edge of your comfort zone. This car forced me to redefine my definition of fast. It’s a bit incomprehensible just how fast it is. Though, even with 560HP, the RS 7 is still a car I’d consider to be easy to drive. Is it a car you bring to the autocross course? Sure, would I? No, I’d leave that to the TT or R8. It’s a car that’s best suited for everyday life. On the highway, the sense of speed is even further removed, and the car floats along Boston’s winter-ravaged highways. While set in comfort mode, the air suspension softens and absorbs bumps effortlessly. How was the fuel economy? My average in city driving was around 12MPG with the lowest observed being 6MPG and the highest 22MPG. The highest is due to the cylinder deactivation that occurs at highway speeds. 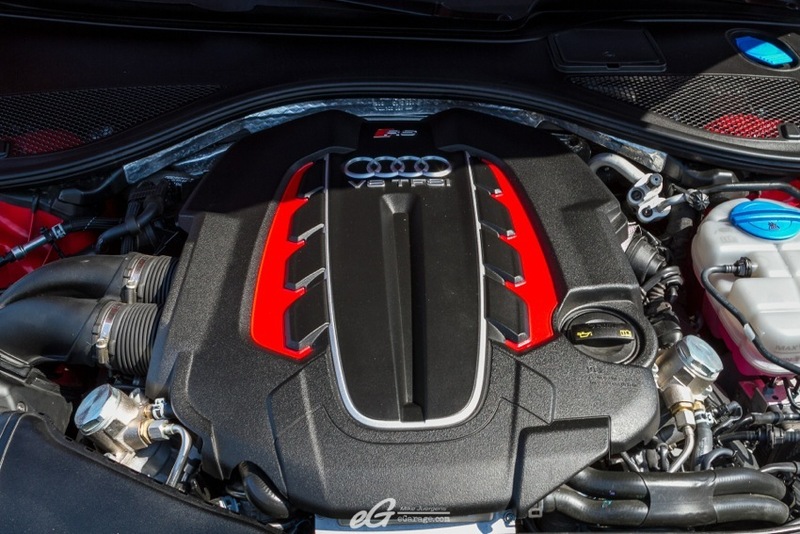 Four of the eight cylinders deactivate and Audi employs active motor mounts and in cabin microphones and speakers to work to cancel out the noise of the 4-cylinder. There was no indication of when the car was operating in 4-cylinder mode. When you needed the power to merge or switch lanes it was always there. 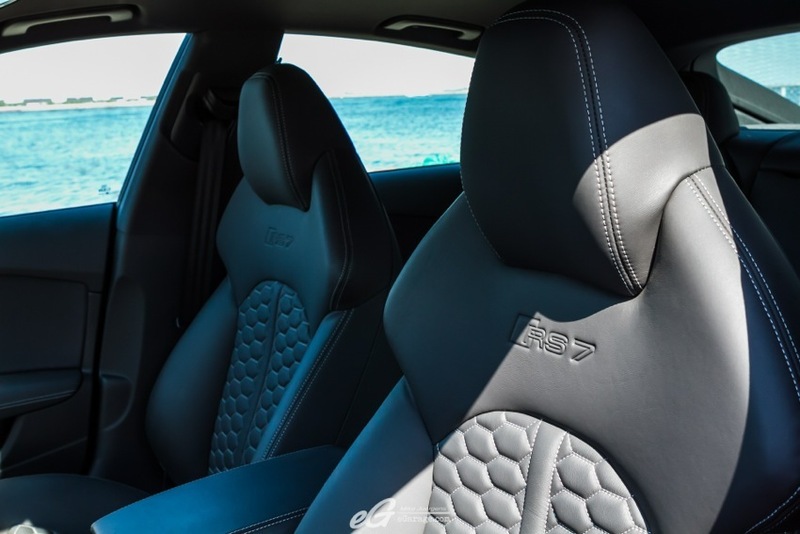 This particular RS 7s options total to $122,545. Included in that is a myriad of safety features. The heads up display project your speed, lane assist, and navigation information on the front window. Though, with my polarizing sunglasses it was a bit difficult to read. There’s also an infrared camera with the pedestrian detection, which locks onto wayward people as they stumble into the busy Boston streets without a care. The adaptive cruise control with an automatic braking system takes some pain out of highway trips in stop and go traffic. 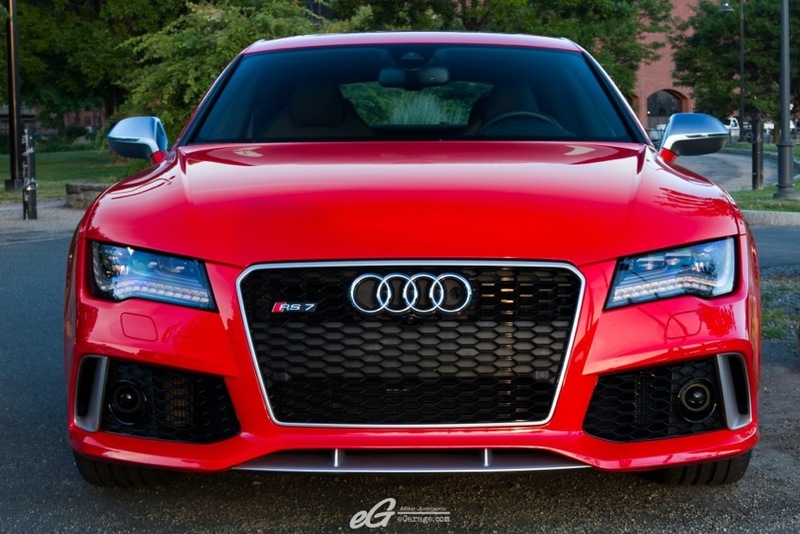 The Audi RS 7 is a remarkably powerful car that will force you to redefine what you thought was fast. But fast isn’t its only strong trait. It’s also extremely luxurious and you can dial it back from a demon to mild. It’s the perfect ride from the financial district office to the golf course in the suburbs for you and your three closest friends. You can be safe knowing that you can trudge along in traffic 364 days of the year, knowing that on your next country drive you can open it up and fall in love all over again.